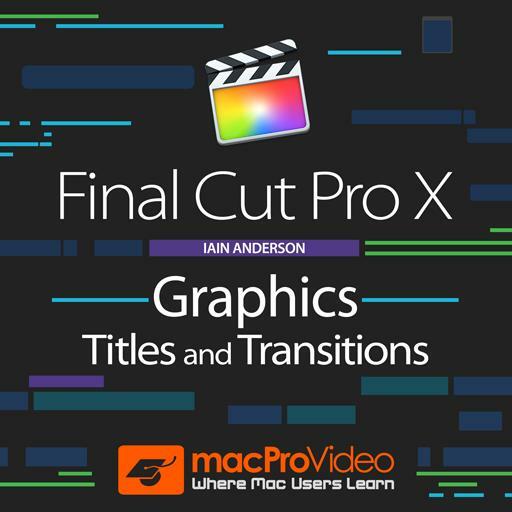 Final Cut Pro X 203 - Graphics, Titles and Transitions. What’s the risk with making the texture scale too small? That the texture will become blurry. That the texture will be too strong. The repeating pattern may become visible. When you replace an image, does it update everywhere it’s used? No, you have to replace in the timeline too. No, it’s not possible at all. What color indicates movement or rotation the Y axis? What color indicates a Hold area in a clip on the Timeline? How do you convert 2D titles to 3D? With the 3D Text Conversion Tool. Check the ‘3D Text’ checkbox. You can always find the font controls here. Always in the Title inspector. How can you change the default transition’s duration? This Generator is the easiest way to pick your own solid color. What effect slows down to a stop? What parts of the interface let you customize a transition? The Inspector, and sometimes on-screen controls in the Viewer. What key performs the Blade Speed operation? Name the three controls at the top of a transition? Ripple Trim incoming, Roll, Ripple Trim outgoing. Ripple Trim outgoing, Roll, Ripple Trim incoming. What common image format does not support transparency? Can Final Cut Pro work with both 2D and 3D titles? No, you have to do titles in another app. What button is next to the Generators in the FCP interface? This option gives the best results for slow motion when new frames have to be created. What’s the name of the most colorful preset environment? How do you eliminate the background from the Placeholder Generator? Choose ‘None’ for the Background and Sky. Choose None for the Background. Choose None for the Sky. This tool lets you adjust a clip’s opacity visually in the timeline without using transitions. You have to use Transitions. What’s the name of the line spacing control? How can you change the default transition? Drag the transition to the Default Box. Only Cross Dissolve can be the default. Right-click on a transition and choose Make Default. Can you set a clip to an exact speed? Yes, use custom speed or drag the speed handle. Only if you shot with a high frame rate camera. No, only the preset speeds. What kind of title is typically used to give a subject’s name and title? What elements of a Photoshop file are lost when imported to FCP? Layer Effects and Layer Masks. Special Effects and Quick Masks.